Elegant and bright residence, surrounded by green hills, not far from the city of Vicenza. The holiday home IL SOGNO offers a refined, romantic and relaxing atmosphere, an ideal place to recover energy in absolute privacy. Its particular location makes it suitable for a relaxing or cultural holiday, thanks to the convenience with which you can reach the main tourist destinations and the most important cities of Veneto such as Venice, Verona, Padua, Treviso, Marostica, Bassano, Lake of Garda, Gardaland, Acquapark Garda, Chioggia, Sottomarina, the most beautiful Venetian Villas, the small Dolomites and the Asiago plateau. For those who love walking or cycling there are trails in the green and scenic. For food and wine in this area are the "roads of wine and typical products" fans as the Prosecco, Soave, Valpolicella, Amarone, the oil of the Berici Hills, Radicchio di Treviso and Bassano asparagus. The owners, travel enthusiasts, who know the area and good food are offered to suggest unusual routes both cultural and gastronomic. The house, newly built and 'full of details designed with extreme care, natural materials such as wood, exposed beams with natural colors. The villa consists of a main area where the owners live, and by a completely independent area reserved for guests. It 'also suitable for long-term stays. THE DREAM is composed of: on the ground floor comfortable open space living area complete with kitchen with all appliances, extendable table and relax area with sofa (possibility transformation bed) library available to guests, a double bedroom with private bathroom. Two large windows overlooking the large garden / terrace, with a beautiful view of the valley and the hills. On the large and bright mezzanine a second double bedroom, an additional sofa bed and a private bathroom with a large shower. separate entrance and large terrace and garden for exclusive use of the guests with a wonderful view of the hills and the possibility to have lunch or dinner under the stars. Free internet connection and parking space. Recently a beautiful and spacious fitness and relaxation area has been added with a Finnish sauna for 3/4 people that can be used, on request, also by guests. In the garden, in the summer, for the exclusive use of the guests an above ground pool measuring 5 m. for about 3. Guests have 2 mountain bikes to take advantage of the many paths in the woods. Two riding stables within 3 km. Leisure activities: Near the house within walking distance there are 2 HANDS, several paths and trails for mountain biking or for lovers of walking or NORD WALKING. Always within walking distance there are 2 restaurants and 2 cottages. For those who appreciate good wine there is the WINE ROUTE Euganean Hills with 40 wineries with guided tours through the vineyards and in the cellar, the i WINE ROUTE OF PROSECCO Conegliano. Many other food and wine tours of the cheese, the sopressa and typical products of the Veneto. Although this is a quiet and green location is a strategic point to reach the Round of Palladio in Vicenza, Lake Garda, the Small Dolomites, Marostica, Asolo, the Arena di Verona, Venice and the Venetian Villas, Padua, Treviso, Asiago plateau, Lavarone Lake. E 'can also request transportation to and from the airport of Verona or Venice or Vicenza Railway Station. I stayed here with my partner and parents for a week, we really loved it. It is in a great location for exploring Venice, Verona, Lake Garda etc. After a day in the craziness of some of the cities it was nice to come back to a place set up high in the mountains. It is a two bedroom apartment, my parents are in there 80's so the ground floor room suited them as avoided steps (although there are steps up from the garden to the apartment). The apartment is well equipped with everything you need including a dishwasher and washing machine. I'd say it is perfet size for 4 people. The hosts Franca and Nadia are very friendly and welcoming, and offer lots of advice for things to do near by. And they have a beautiful dog and cat! So i'd recommend! It has been a pleasure to meet you and your family ..
You really took the chance to explore many beautiful things here around ...and I have been surprised about your parent's energie ...I hope to go on on that way in my life !!!! We thoroughly enjoyed Franca and Nadia’s place in the heart of the Veneto! It was a great location to access the entire region and beyond (ie: from Venice to Lake Garda to Valpolicella)! We received terrific recommendations from Franca for towns to visit and place to eat. All were exactly what we were looking for. We recommend this place to anyone who wants to enjoy the Region and have a breath taking view as well. Grazie Mille Franca!! You have been every day in a different place and you took the chance to taste the wine and the food ....great offer from veneto region. You have been surprised form the beauty of the region and the cities ...so it has been a very nice holiday .....see you soon. Beautiful well kept property with great hosts. 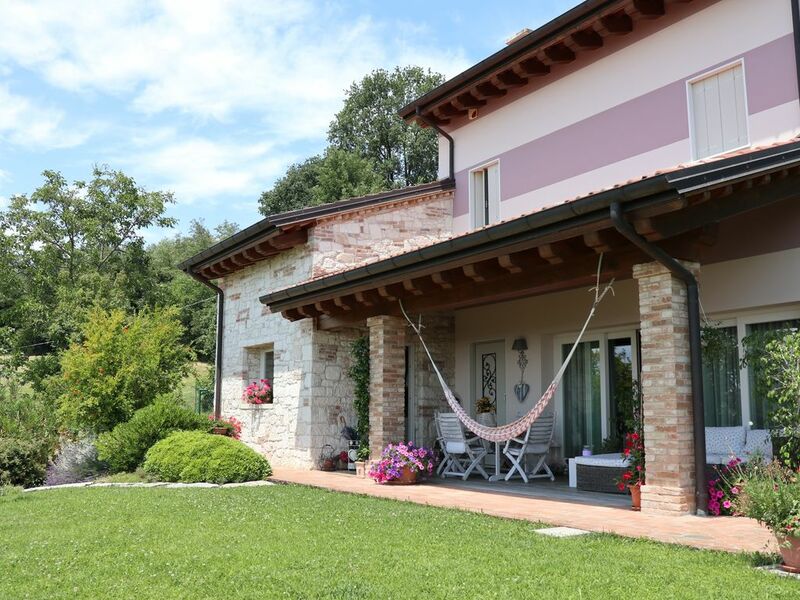 This is a really nice property situated at the top of a very large hill away from the hustle and bustle of nearby Vicenza and an hour from Verona but in easy driving reach to amenities and a 160mph train trip to Venice, which is only 40 mins away by train. Superb views from the property. Our hosts Franca and Nadia were very accommodating and willing to offer advice on local attractions and restaurants. it has been nice to meet you and we we are really happy to have hosted you. You took the opportunity to do many things here !! ...and as you could see we are at the center of the region and comfortable to reach the most beautiful places in the Veneto. We are always happy to share our corner of paradise that offers a lot of relaxation after every day trips. perfect place to relax in central Veneto! We have been 2 weeks at *Il Sogno* . We have had sun, sun and sun, temperatures up till 36degrees, but also al little rain in the evening and a real storm the two last weeks of june! The house is luxurious (all equipment) and very complete including wifi, airconditioning, enough towels, basic products like washingpowder etc.....situated on top of a hill with breathtaking views! An ideal location to visit very beautiful places like Venice, Bologna, Padua, Chioggia, Verona (we went to Nabucco in the Arena, highly recommended to do when you have the opportunity) and last but certainly not least Vicenza so nice! In the garden is a pool; we used it every day, so lovely! We arrived late at night and were so friendly welcomed , we felt at home right away! Nadia and Franca the owners of the house are so warm, friendly, helpful (we dit get many great tips, even perfect help when our daughter had an urininfection) and funny ladies, we enjoyed it very much to spend some time with them, thank you ladies!!!!!! We are going to miss you and Italy! Kram och puss from Sweden! we have to say that it has been our pleasure to meet you and welcome you in our house . !!!.. and are very happy when guest take the chance to descover the beauty of the region ... and you have done so much !!! So we send a big hug to everybody ...and hope to meet you again. We stayed for six weeks. Owners, Franca and Nadia, are terrific poeople and very, very helpful. The apartment has a lot of charm inside and out. Lovely grounds and views. Although in a small town, there are three restaurants within walking distance. The place in immaculately clean. We highly recommend that you consider this place and thee owners if you are considering this area of Italy. we are glad that you appreciated all our suggestions to visit the surrounding and that you could enjoy the Italian food and the main list of the best restaurants we gave ..
Hope to have the chance to meet again ...and we wish all the best and good luck for your life !!!! Brilliantly rural with the perfect peace and quiet so often promised but so rarely delivered. We had been a little wary of the house being semi-detached. However, in practice, this turned out to be only an advantage in that Franca and Nadia are so helpful and friendly but not intrusive in any way. The house is a great mix of modern conveniences in a traditional type structure and all so clean. Terrifically well equipped. Certainly one of (if not the) best houses that we have rented throughout the world and over many, many years. We even want to return which is unheard of for us! Please note that the local roads seem somewhat challenging at first but one soon gets used to them. thanks a lot for your warm words and symphaty. We have been very happy to meet you and your nice kids and the olive three you gave us and you planted on our garden has been a very appreciated surprise. We are delighted that you enjoyed the layout of the home that allows total privacy to guests as it was a single home. We have studied precisely for this reason a solution that guarantees us and the guests complete independence and freedom, thank you for expressing it. We wait for your again ...good luck to you and all the family. The dream is located in a hilly area not far from the city of Vicenza. Immersed in the green but strategically convenient to the trade fair, railway, motorway and all the main tourist areas in Veneto such as Vicenza, Venice, Verona, Padua. Within walking distance there are 2 restaurants, riding stables and a farm. Many trails on foot or mountain bikes.